"I'm tight with organizations like Sinclair. I try to respect their deadlines as my own," the Reaper said. "I strive to preserve the synergy that exists between us." Of course that's the midnight analyst in me talking. The weathered photog in me says 'screw their motive, get 'em out of my shot!" I know more than a few lenslingers will even less patience than me who wouldn't think twice about physically removing said invader, regardless of WHAT satirical bent he's pursuing. I hope this doesn't happen, otherwise the Grinning Reaper may get a camera battery to the rubber-masked temple and worse yet, a photog may lose his job. Sorry to hear that you guys are having this particular problem. I fear that it's only a matter of time before this spreads to the my area. I'd be interested in hearing how you guys end up dealing with this situation. Why not try and fake these people out? Set up and go through the motions of doing a live shot and let them do their idea of "the Lord's work”, feign anger and then pretend to pack up. Then do the live shot after they leave for their victory celebration. Or, interview them. Ask them questions they couldn't possibly answer. The equivalent of the teacher making you tell the whole class what you were snickering about. Or even better. Have all your reporters wear an invisible suit, grim reaper outfit or mask. Then have them go to these peoples’ houses and/or workplaces and pretend to do a interview with them. Finally. Get technicians to graphically insert smiley faces (or donkey butts, whatever)over there faces, or tag on a caption like “Please pay attention to this poor fool who so desperately needs it.” Something like that. Maybe even have a weekly feature called "Morons we have to deal with". That could make eveybody happy. As a viewer I would enjoy laughing at them, they would enjoy the attention and you would have something to put on the air on days when you didn't catch the Pope selling crack or there were no shoot outs with Bigfoot. im just happy to something different on the day to day drab of news. its like playing wheres waldo? with my tv set. "somebody died, blah blah blah, this got stolen, blah blah blah, war in the..., blah blah blah, crazy guy in invisible suit walks by camera, YEAH WE FOUND HIM! !, next channel." There was a time as a young photog I might have forcefully removed them. Now as an old photog we do so many foolish live shots BECAUSE WE CAN! 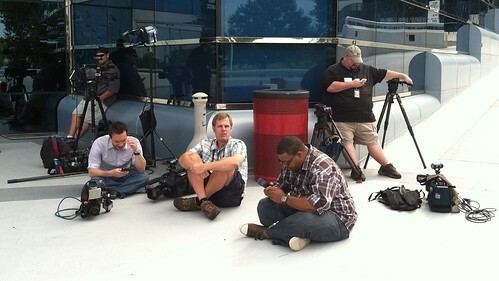 Those who want to disrupt our live shots have the same right to be on public property as we do. WE are to blame, sports shots with crazy fans yelling and mugging for the cam. Should they read our minds that this is a serious story so your should act accordingly. Acting stupid is so easy WE do it every day.